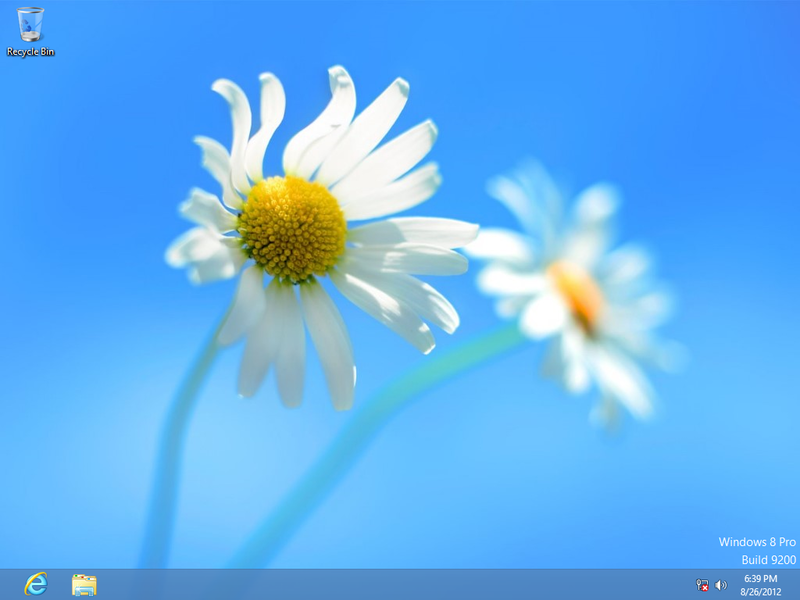 Clicking on the Desktop tile shows a Windows desktop. Freedom from Metro? Not quite. The most notable difference from a Windows 7 desktop is that there is NO START MENU! 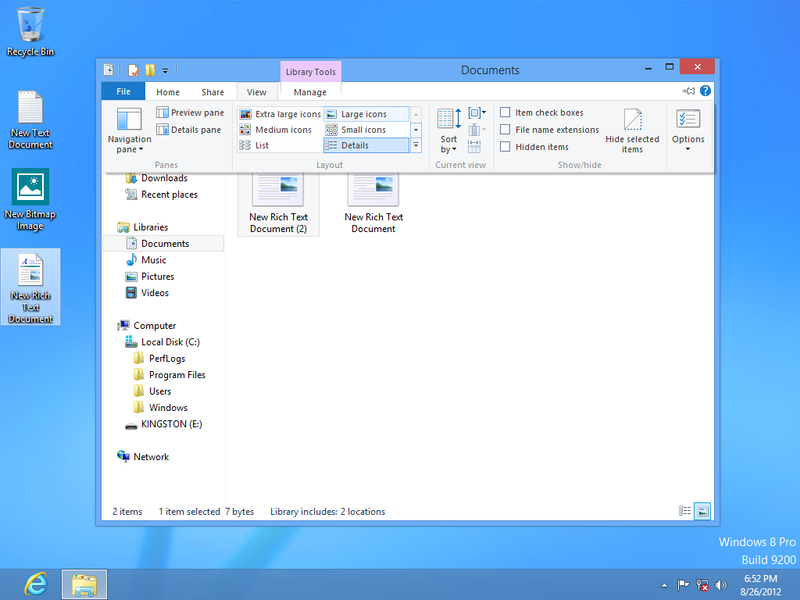 Microsoft also removed "Gadgets" from the desktop. Oh, flowers! As if giving you flowers would make up for the total destruction of your desktop. Clicking in the lower left corner of the screen toggles you back to the full screen Start Page. The Explorer "command bar" is changed around from Windows 7. Notice how the ribbon interface is evolving back in to old fashion menus, just with more clutter. 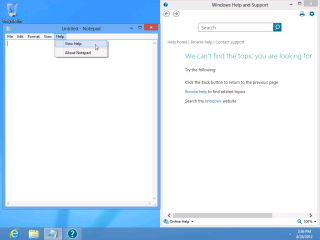 Since the normal bundled Windows applications are not included on the main Start Page, it is impossible to easily find anything. 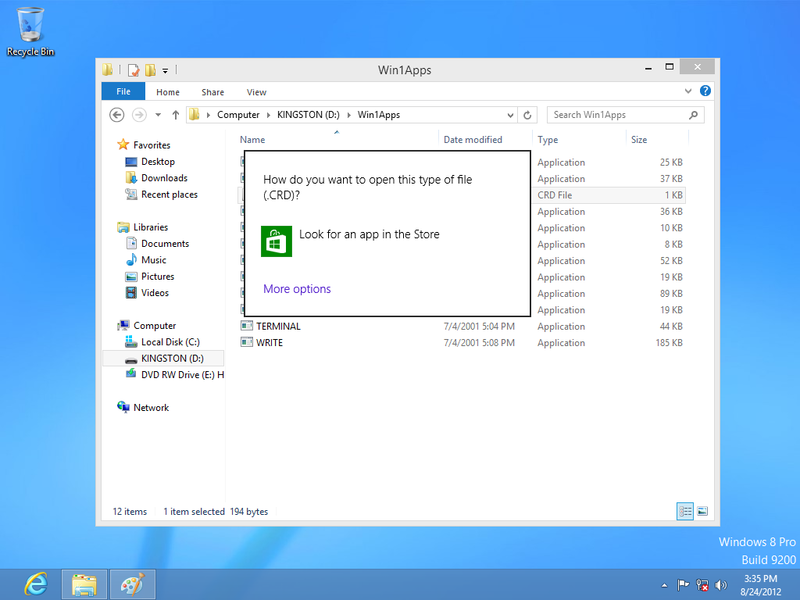 It is possible to create a desktop shortcut to "C:\Users\[your user name]\AppData\Roaming\Microsoft\Windows\Start Menu\Programs"
Start key + "R" opens the run dialog where you can type the name of a Windows executable. You can also browse to your Program Files folder to run programs directly, create shortcuts to them, or pin them. It's back to the Windows 3.1 way of doing things. 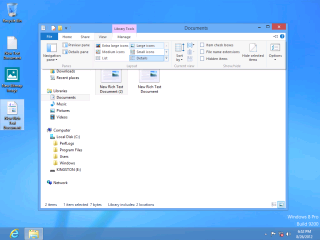 Launching certain kinds of files will switch you back to the Metro interface. Certain message boxes and dialogs are also "metrofied". 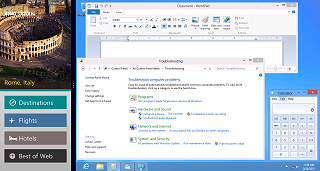 They have no windowing controls and may cover the entire screen. 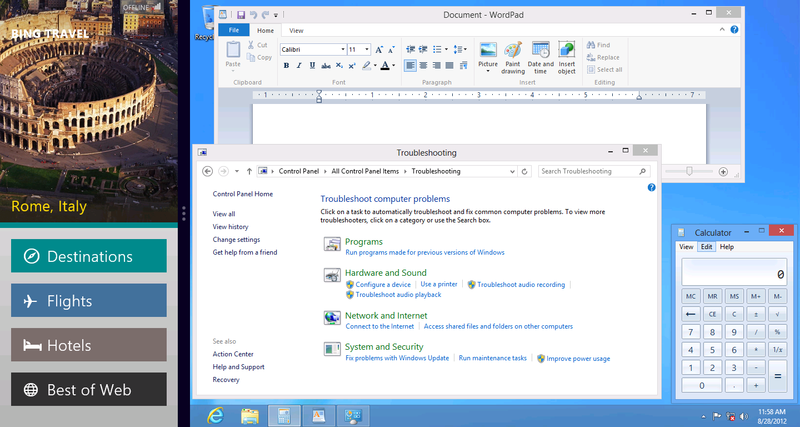 In this example, attempting to open an unknown file type displays this dialog. 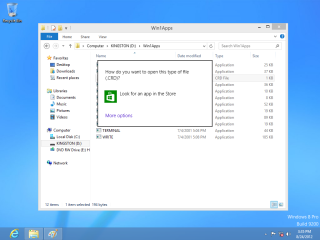 It prominently advertises the Microsoft store, and there is no visible option to cancel or dismiss. Even ALT+F4 fails to close it! The trick on this one is you have to click OUTSIDE the dialog. The Windows desktop is customizable separately from the Metro desktop. 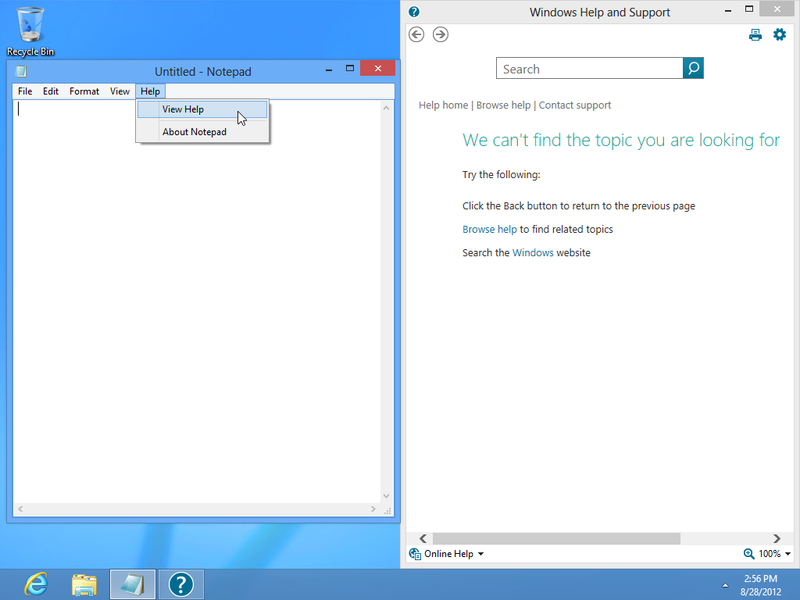 This uses the desktop control panel, which is also separate from the Metro control panel. No connection to Microsoft's web site? No help for you! And Microsoft gets to know every help request you make! A Tutorial for all this stuff would have been nice. 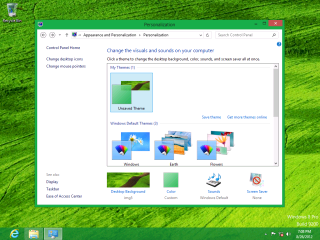 In Windows 7, we already had three distinctly different application user interfaces styles. 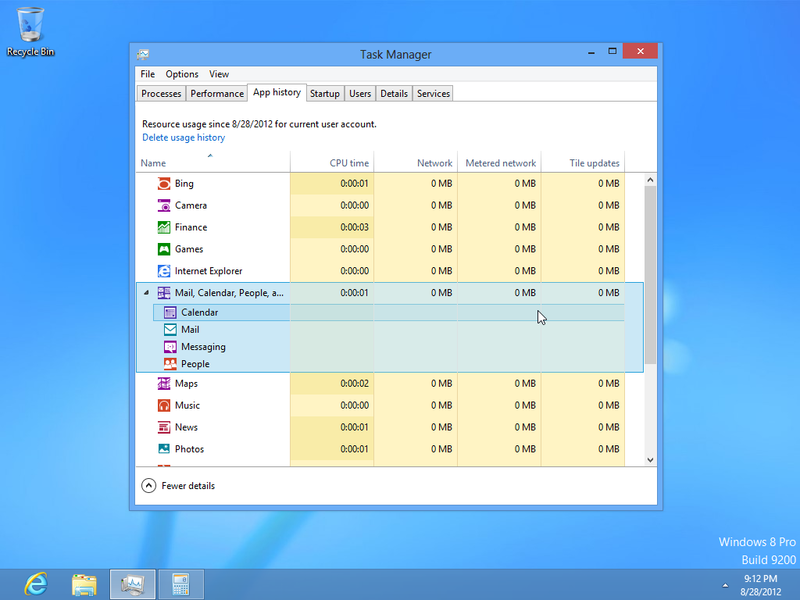 With Windows 8's Metro, that brings the count up to 4! Thanks so much for simplifying everything! From the desktop side, the only other thing of any real notability is that they re-did the task manager. 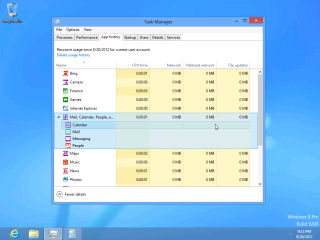 By default it shows only a simple iconic list of running applicatons, kind of like the task manager in Windows 9x. Showing more detail shows the same information as previous, plus some "app" related details.